and no explanation for their landlord! Filmed At: at Screen Gems Studios 6 and 7, Hollywood, CA, and on location at Malibu Beach, CA, and in Malibu Canyon, CA. Rerun Dates: December 6, 1969, July 11, 1970, September 18, 1971 (CBS); December 16, 1972, July 21, 1973 (ABC). While David attempts to flip at the beach, young Jonathan Fisher arrives and asks him to watch his pet black stallion Jeremy. David agrees but the boy suddenly runs away, leaving David no choice but to take the horse home. There, Peter serves Micky and Michael a dish of his own recipie: a cream of root beer soup; when Micky tries some of it, he�s Micky breaks out into a werewolf routine that attracts their landlord, Babbitt, who hates animals. He starts quickly starts banging at their door and confronts them, suspicious they are keeping a dog. Threatened they will lose their home if they defy Babbitt�s rules against pets, they explain it was Micky�s werewolf imitation. They successfully fool their landlord, until Michael sees David with Jeremy in the pad, and tensions mount even further! Michael explains to David about Mr. Babbitt which ends up with Micky again breaks out into his werewolf routine that again attracts their landlord, who bangs on their door once more. Since they can�t get the horse to budge, Michael comes up with an idea and sends Peter and David to hide before letting Mr. Babbitt in again. He again accuses them of having a dog as Michael plays innocent once more. He starts to leave, promising to return�but this time, he turns around spots the black stallion! Michael covers up by claming it�s only Peter and David in a horse�s costume for a masquerade party and seems to have slipped the wool over the landlord�s eyes once more. After Babbitt leaves, they try to drag the horse outside, but he refuses to budge. While David rushes upstairs to fetch their horse costume in hopes of further deluding Babbitt, Peter manages to coax the stallion with a dish of his �soup,� and the horse collapses from fatigue. Michael then phones Dr. Mann, a confused, scatterbrained veterinarian, and arrives at his office asking for his help about the sick horse, and the doc agrees to help ("Sick?! I can probably help him! I'm a veterinarian!"). Back at the pad, the confused vet mistakenly examines Peter and David whom are now disguised in a horse�s costume since the real horse is hidden and upon hearing their voices concludes that the horse has delusions of singing and a split personality! Then everyone hears knocking upon their door. Fearing it�s their landlord who might see the vet and start asking him questions and get suspicious, Michael puts the confused doc in their closet, stating a sick owl is in there, and again the doc agrees to help ("A sick owl?! I can probably help him! I'm a veterinarian, you know!"). Michael answers the door and it turns out to be their neighbor, Mrs. Purdy, who offers the boys cake but Jeremy enters the room and starts eating it which causes Mrs. Purdy to faint! Michael shouts upstairs to Micky, who tosses a smoke bomb down from the balcony and fills the entire beach house in a fog. Through the mist, the two�along with Dr. Mann�try to revive Ms. Purdy, who keeps waking up and passing out. To clear out the air, Michael opens the door only to see Mr. Babbitt standing at the doorway accusing them of having a real horse in their apartment. So he quickly slams the door in his face, and then tells Peter to put the horse�s mask back on. When he opens the door again for Babbitt, Peter with the horse�s mask speaks to him, and the landlord faints dead away, too, thinking it's a real horse! The next morning on the beach, David, riding Jeremy, encounters Jonathan again who tells him that his father, Mr. Fisher, is determined to sell the horse because they can�t afford to keep him. He asks David to talk his father into keeping the stallion, so The Monkees, deciding to help Jonathan keep his pet, drive to the farm in by jeep. They offer to pay for the horse by working it off as farmhands for a week in order to make $100 which is what the horse cost and Mr. Fisher decides to try them out for one day. The next morning, Mr. Fisher (banging a triangle) wakes the foursome, who are sleeping in the barn early up for work but, having no experience as farmhands, all goes poorly as the guys blunder every chore giving to them; from burying Peter under hay while pitching it to Micky, in demonstrating to Peter how to call hogs, emitting a call (so loud that their landlord can hear from their apartment building!) which ends up attracts chickens instead. Then the guys attempt to milk a cow and they romp around to the tune �Papa Gene�s Blues�, attempt to milk a cow has Michael emulating a matador routine�and ends with Mr. Fisher being drenched with a pail of milk and firing them. The Monkees television series began production with the filming of �Don't Look A Gift Horse In The Mouth,� directed by producer Bob Rafelson. He has directed 5 further episodes of the series (Episode Nos. 3, �Monkee Versus Machine�, 5, �The Spy Who Came In From The Cool�, 17, �The Case Of The Missing Monkee�, 32, �The Monkees On Tour�, and 54, "The Monkees In Paris"), 2 of which he also wrote (#32, �The Monkees On Tour�, and 54, "The Monkees In Paris"), and, of course, he went on to direct (as well as write and produce with Jack Nicholson) his first movie: The Monkees' 1968 feature film HEAD. �Don't Look A Gift Horse In The Mouth� was telecast on NBC exactly 6 months after it started production. On the first day of shooting, Bob Rafelson took The Monkees TV cast and crew by truck and van to Malibu Canyon where several locations, including a farm, had been sought beforehand. When they arrived at the farm, Rafelson discovered the gate was locked and there was no farmer; he suggested knocking over the gate and worrying about it later to a Screen Gems official, who refused to do so without an OK from Screen Gems. So Rafelson sent him to search for the farmer and then, in his absence, commandeered the first truck which he used to ram the gate, and the crew marched in. �Don't Look A Gift Horse In The Mouth� originally ended with Micky, Michael and Peter stepping in to prevent David from minding a baby elephant! This is one of four Monkees episodes to use the shot of The Monkees' beach pad in the submain title credits (writer[s] and director) sequence; others are the premiere episode, �The Royal Flush�, Episode No. 4, �Your Friendly Neighborhood Kidnappers�, and No. 52, "The Devil And Peter Tork". 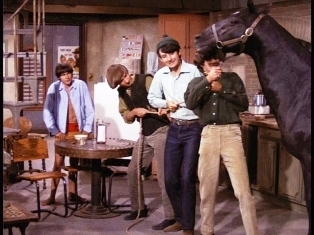 Michael Nesmith's heretofore unreleased �All The King�s Horses� makes its second and final appearance in this episode, following its first usage in Episode No. 5, �The Spy Who Came In From The Cool�. Though there have been and eventually will be episodes of The Monkees which either feature extended mixed of songs which were later edited down or earlier/alternate mixes of songs which would later be rerecorded, �All The King�s Horses� is one of only 2 actual Monkees track to appear on the TV series yet not to originally see release on a record; the second is �R�u, Ch�u�, which The Monkees will perform in No. 47, "The Monkees Christmas Show". Both were later exhumed for Rhino's Missing Links Volume 2 (R2 70903, released Jan. 23, 1990), which features other rarities from the TV show soundtrack. When �Don't Look A Gift Horse In The Mouth� was first rebroadcast on CBS Saturday, �All The King�s Horses� was replaced by Boyce and Hart's �I Never Thought It Peculiar�. Collector's Note: The version of �All The King�s Horses� included on Missing Links Vol. 2 is unlike the TV version, as it adds extra backing vocals, including an added harmony lead vocal by Micky Dolenz. 2 different remixes of �All The King�s Horses� can be found on on the 2001 Monkees Music Box (R2 76706) CD set and the 2006 2-CD Deluxe Edition reissue of The Monkees' first album (R2 77678). And a special Mono TV Version is included as a bonus cut on Rhino Handmade's limited-edition, November 11, 2014 3-CD, 100-track set, The Monkees (Super Deluxe Edition) (R2-543027). This was the seventh and final Monkees episode bearing a "Musical Numbers Produced by" credit in the end titles. Snippets from this episode of The Monkees performing �Papa Gene�s Blues� previously appeared in �The Monkees In A Ghost Town�; it turns up again in Episode No. 19, �Find The Monkees� (a.k.a. "The Audition"). The Monkees' "mod" attire and background settings as seen in �Papa Gene�s Blues�' musical sequence were reused for the number for �She�, which will bow 3 episodes later, in No. 11, �Monkees A La Carte�. Stu Phillips recorded background cues for this and Episode No. 3, �Monkee Versus Machine�, from 2-2:45 p.m. in RCA Studio C, Hollywood, on Friday, July 8, 1966. These were the first on his agenda. The version of �Don't Look A Gift Horse In The Mouth� as released on VHS in July 1986 by MusicVision/RCA/Columbia Pictures Home Video features the infamously famous "Black Label by Yardley�" symbol in the end credits; the version of the episode as released by Rhino in October 1995 on their Deluxe Limited Edition Boxed Set and in May 2003 on The Monkees Season One DVD Boxed Set does not. David acquires a horse from a little boy on the beach by his apartment. Later we see that the boy lives on a farm--miles away from David. How a little boy like that could find his way to and from the beach where he left the horse is anyone's guess. Michael's head changes position between shots while The Monkees are working in the barn. When the horse gets sick, Michael somehow has the number to the vet memorized. For the first and only time on The Monkees TV series, David Jones exhibits his superior jockeying skills. Jones chucked the stables for stardom when he weighed too much to be a pro jockey. He fondly recalls his old jockey career in Episode No. 10, �Here Come The Monkees� (Original Pilot Film) and No. 38, "I Was A 99-lb. Weakling", and he is seen mounting a horse and riding off---facing the wrong way!---in No. 45, "The Monkees In Texas". When David, Micky and Peter go horse riding in Episode No. 32, �The Monkees On Tour�, Peter mentions that David had been a jockey. The scene of Michael dressed as a matador waving his red cape in �Don't Look A Gift Horse In The Mouth� can be seen in the first season main title sequence for The Monkees. Just before he calls the hogs, Peter Tork uses a pitch pipe to help him warm up. In Episode No. 34, "The Picture Frame" (a.k.a. "The Bank Robbery"), Michael Nesmith will be seen blowing into a different pitch pipe, when told by The Sergeant (Dort Clark) to "change your tune!". Here, Micky Dolenz is seen merely imitating a werewolf. 42 episodes later, in No. 50, "The Monstrous Monkee Mash", he will become one himself! David Jones is seen wearing the same light blue jacket and red swimming trunks he wore in the series premiere, �The Royal Flush�, Episode No. 6, �The Success Story�, and No. 10, �Here Come The Monkees� (Original Pilot Film). David can also be seen wearing the same cardigan he wore in �Here Come The Monkees� (Original Pilot Film). The A-side of The Monkees' first single, �Last Train To Clarksville�, hit #1 on the Billboard charts in the same week as the airing of this episode (on Saturday, November 5). Here, The Monkees are seen driving a jeep to the Fisher farm. This is one of 5 occasions which sees the quartet driving a vehicle other than their Monkeemobile; they are seen in a woody station wagon in �Here Come The Monkees� (Original Pilot Film), a golf cart in No. 45, "The Monkees In Texas", a multicolored jalopy which breaks down during rush-hour traffic at The Arc De Triomphe in No. 54, "The Monkees In Paris" (a.k.a. "The Paris Show"), and a dunebuggy in the movie HEAD. When Fisher wakes The Monkees in his barn with his triangle, he intones, "It's Tuesday morning!" This quote has 2 references: first, filming of this episode began on a Tuesday morning, May 31, 1966. Second, Tuesday morning follows Monday night, where The Monkees TV series was slotted @ 7:30/6:30 Central Time on NBC. (Michael Nesmith makes brief mention of their timeslot in Episode No. 58, "Mijacogeo" [a.k.a. "The Frodis Caper"], the series finale. The black stallion who portrayed Jeremy, ridden by David in "Don't Look A Gift Horse In The Mouth," had ties to an earlier NBC series: Gypsy, who portrayed the titular horse of the 1955-60 NBC Saturday Morning Western Fury. In 1977, Henry Corden (Mr. Babbitt), would take over as the voice of Fred Flintstone in the place of the late Alan Reed in later cartoon versions of The Flintstones (ABC, 1960-66) and related projects. The late Jim Boles, who plays Farmer Fisher here, appears briefly as The Preacher in Episode No. 39, "Hillbilly Honeymoon." Boles was a regular on Kraft Music Hall Presents The Dave King Show (NBC, 1959) and previously played Joe Yarbrough on One Man's Family (NBC, 1949-52). He and Bing Russell (�Here Come The Monkees� [Original Pilot Film]) were featured in a September 21, 1961 episode of The Twilight Zone (CBS, 1959-64), "The Arrival." The late comic/actor Jerry Colonna (seen here as the wacky vet Dr. Mann) was featured in more than a dozen films, including Road To Rio (Paramount, 1947, as Calvary Captain) and Meet Me In Las Vegas (MGM,1956, as Himself). His appearance on the show Hour Glass (NBC, 1946-47), the first hour-long entertainment series of any kind produced for network TV, helped pave the way for the ever-increasing medium of television; he also emceed his own namesake program of music comedy and variety, The Jerry Colonna Show (ABC, 1951). �Don't Look A Gift Horse In The Mouth� retains the only appearance of Jesslyn Fax as The Monkees' neighbor Mrs. Purdy. Other episodes which bear onetime appearances of other Monkee neighbors are No. 6, �The Success Story�, No. 36, "Monkee Mayor", and No. 58, "Mijacogeo" (a.k.a. "The Frodis Caper"). Kerry MacLaine (Jonathan) later appeared with Monkee guest alumnus George Furth (�One Man Shy� [a.k.a. "Peter And The Debutante"], "A Coffin Too Frequent") in a May 12, 1969 episode of I Dream Of Jeannie (NBC, 1965-70), "Blackmail Order Bride," its fourth season finale. Chuck Bail (Jenkins) has directed episodes of TV series such as Knight Rider (NBC, 1982-86), CHiPs (NBC, 1977-83) and Baywatch Nights (Syndicated, 1995-97).